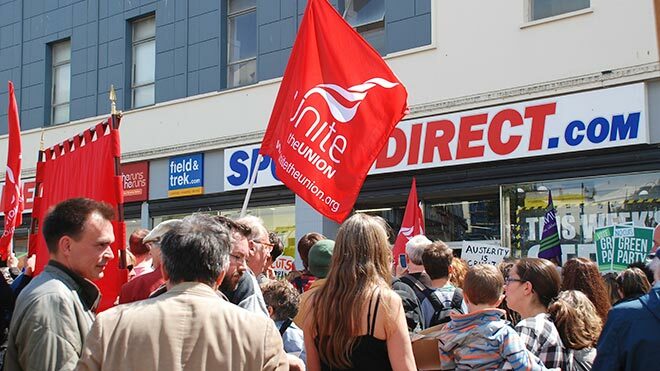 May 2015: Protest against zero hour contracts outside the Hastings branch of Sports Direct. Ahead of next week’s Sports Direct company AGM, the company’s Chair Keith Hellawell is coming under increasing pressure from unions and minority shareholders over his handling of the company’s governance and longstanding bad employment practices. Sports Direct are a huge and controversial presence on the UK high street. The discount sports retailer employs over 24,000 staff, the vast majority estimated to be on zero hours contracts. Mr Hellawell and Sports Direct have also faced widespread criticism following the collapse of their USC subsidiary company in January, which left many staff redundant with just 15 minutes notice, and £15.3m of debts to suppliers and landlords, including a bill of £700,000 to the taxpayer. The latest calls for Hellawell to go are being co-ordinated by Trade Union Share Owners (TUSO). It’s a coalition of trade union investment and pension funds (including the TUC, Unite, Unison and the International Transport Workers Federation). TUSO has over £1.5bn of assets on the capital markets (including shares in Sports Direct) and uses it for shareholder activism around workers’ rights and better corporate governance. TUSO have written to Sports Direct’s other shareholders, urging them vote out Hellawell, under new Financial Conduct Authority rules that have come into force since Sports Direct’s last AGM. The company has previously avoided shareholder rebellions thanks to billionaire founder Mike Ashley’s 55% controlling share, but the new FCA rules, specific to companies that have a controlling shareholder like Ashley, mean the election of non-executive directors has to be approved separately by minority shareholders. Last year, one in five independent shareholders voted against Hellawell’s appointment, and the new rules mean more will likely rebel this time round. The call comes after MPs on the Scottish Affairs Select Committee accused Mr Hellawell and his board of running Sports Direct like a “backstreet outfit”, and the Institute of Directors described their handling of the USC crisis as “dysfunctional” and “not acceptable” for a FTSE 100 company. That the performance of the Sports Direct Board is affecting the company’s performance and value. Morgan Stanley earlier this year put a 20% discount on Sports Direct shares because of poor governance. “Shareholders and workers both have an interest in reform at Sports Direct. We all want to see a successful business, but this success needs to be built on strong governance and good employment practices, not zero-hours contracts.